Every effort has been made to accurately represent this product and it’s potential. Any examples of actual benefits can be verified upon request. The testimonials and examples used are exceptional results, don’t apply to the average purchaser and are not intended to represent or guarantee that anyone will achieve the same or similar results. 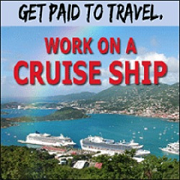 Each individual’s success in obtaining work on board cruise ships depends on his or her background, work history, dedication, education, skills, desire and motivation. As with any endeavor, there is an inherent risk of loss of capital and there is no guarantee that you will succeed. The information on this site is provided as a resource of opinion and does not constitute professional advice. We cannot be held liable for any damages or losses caused by the products or services listed on this website. It is advisable to assume that any mention of a product or service on this website or within the information products contained therein, is made because there exist, unless otherwise stated, a material connection between the product or service owners and this website and should you make a purchase of a product or service described here the owner of this website may be compensated.